Seigneurie-des-Aulnaies is a historical estate representing historical French settlement on the Saint Lawrence River, near Quebec. The first traces date back to 350 years ago, while the famous mill was built in 1739. It is located about 110 km from Quebec on the right bank of the great river and is a popular destination for outdoor excursions. 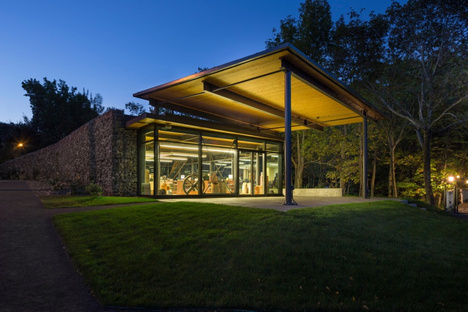 The architects from Anne Carrier architecture were tasked with creating a new welcome and visitor centre, at the same time making the most of the historical structures, bridges and stone buildings. 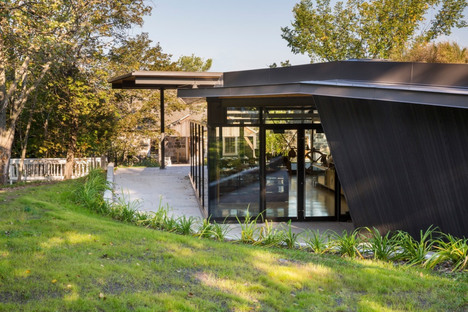 All while paying great attention to the sensitive context, minimising the pavilion's environmental and visual impact and at the same time sticking to the tight budget. 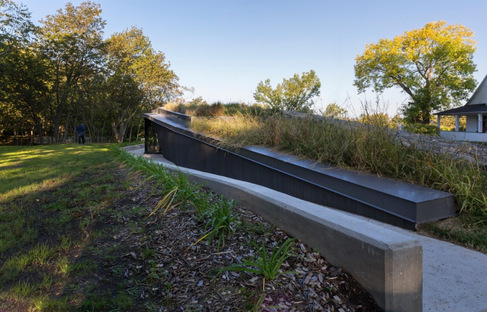 So the architects opted for a Land Art approach to integrate the new pavilion by taking advantage of the site's natural slope. 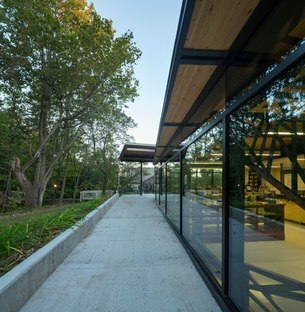 The first wood and stone volume is used for services, while the second volume, finished in glass and dedicated to educational activities, opens onto the landscape and "frames" the historical mill and its activities. 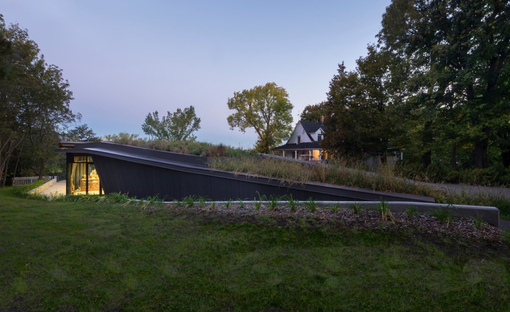 The gap between the two new volumes provides a view of the St. Lawrence River and on the street side, the gabion wall guides pedestrians towards the entrance. 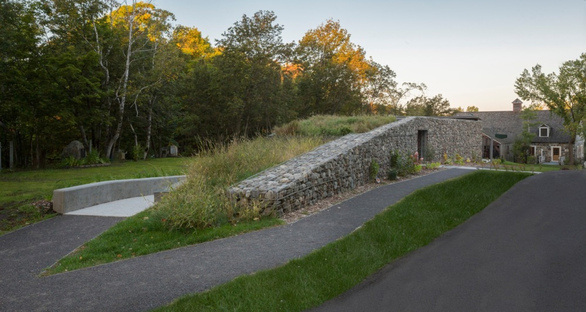 In addition to the choice of materials, with a predominance of local stone encased in wire mesh for the gabions and matching the stonework of a nearby retaining wall, integration of the landscape is also facilitated by the building's green roof. 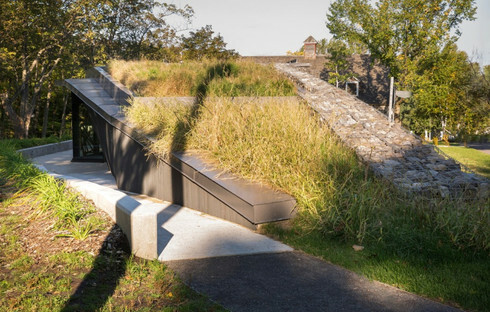 Here the grass looks like it is growing out of the slightly downward-sloping ground, emphasising the idea of landscape architecture rather than an actual building. 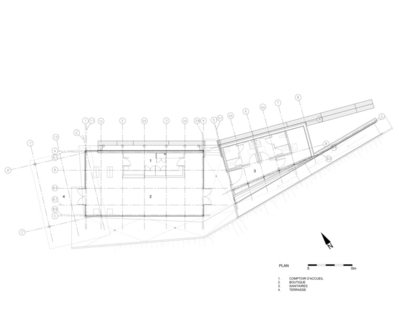 Apart from the challenge of integrating with the surrounding environment, it was also necessary to address the project's social aspects, namely gaining favour with visitors, a successful challenge assisted by an actively involved client who was open to new ideas to offer an all-round pleasant experience for visitors to Seigneurie-des-Aulnaies. 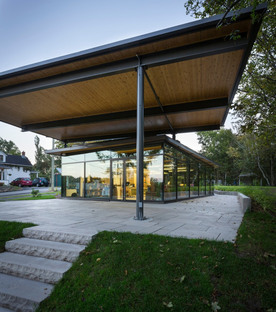 The project of the Seigneurie-des-Aulnaies visitor centre reflects the contemporary approach of Anne Carrier architecture to sensitive contexts. 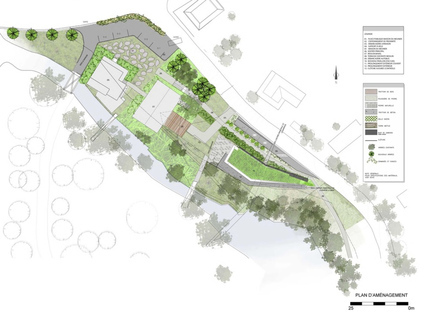 By offering thoughtful solutions in harmony with surrounding natural, cultural and urban landscapes, the firm seeks to contribute to the success of a distinct local architecture that will be an integral part of tomorrow's heritage.